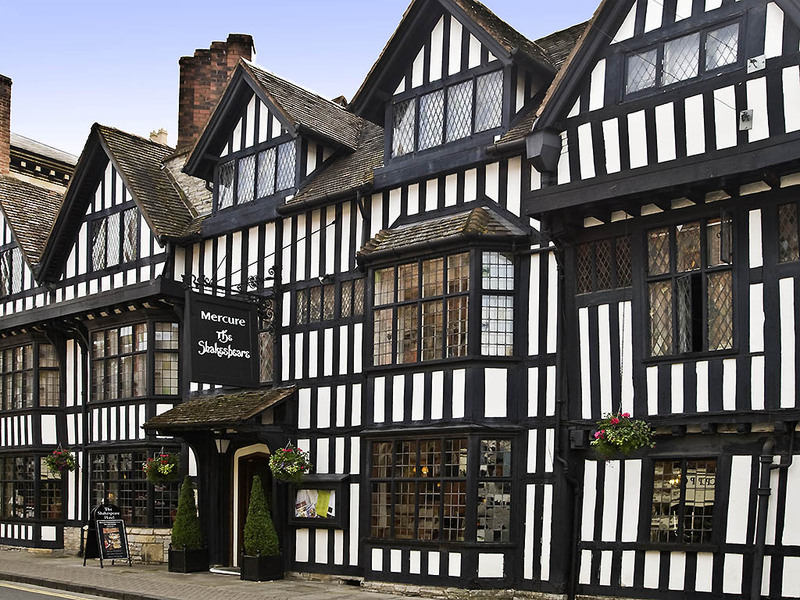 The Mercure Shakespeare Hotel is a traditional 4-star hotel which sits in the heart of historic Stratford-Upon-Avon. Just a short stroll away from Shakespeare's birthplace, the RSC theatres and local shopping, this hotel is convenient for those looking to explore and relax. Guests can choose from classic, privilege and suite rooms, all of which are furnished with cosy yet modern décor. Guests can enjoy lunch or dinner in Marco's New York Italian, which serves delicious Italian and American cuisine. Shakespeare's houses, the Butterfly Farm, Holy Trinity Church, Royal Shakespeare Theatre, the town of Stratford-upon-Avon, Warwick Castle, Birmingham Airport, Birmingham NEC. Car park on site, entrance at 7 Sheep Street. Spaces can be reserved for blue badge holders. The hotel offers 78 individually named bedrooms including doubles, twins and junior suites with either a four-poster or king-size bed. Adjacent to the Hotel is a New York Italian restaurant by celebrity chef, Marco Pierre White. Marco's New York Italian is the perfect setting for lunch or dinner; with a large bar and terrace it's ideal for sitting back and relaxing with drinks. Enjoy a traditional afternoon tea, with delicious homemade scones and clotted cream or freshly cut sandwiches and delicious cakes and in the evening it is the ideal location to meet friends for cocktails or choose a glass of wine. Znakomite miejsce i klimatyczny stary budynek, przy pełnym komforcie w pokojach. Dobre &quot;angielskie śniadanie&quot;. Trudno znaleźć jakiś zarzut.